Stream restoration is the re-establishment of a stream to a state that is more reflective of its predisturbance form. Although many projects that are referred to as restoration have endpoints designed to mitigate negative anthropogenic (human) effects, not all have a goal that focuses on the ecological health of the system. For example, a stream with extensive aquatic plant and algal growth caused by cultural eutrophication may be restored with the goal of increasing recreational opportunities on the stream, but not necessarily a return to the native condition. 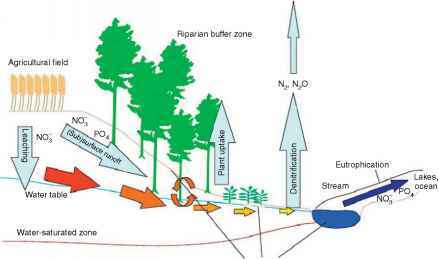 Stream structure and function may be improved by reducing nutrient loading; however, plans could also include aspects that have a negative ecological effect such as controlled flows to maintain navigable water, or construction of visitor parking lots and buildings on riparian areas. Ecological stream restoration focuses on restoring and/or improving stream ecosystem structure and function, that is, on improving the ecological integrity of the system. This holistic approach encompasses the physical, chemical, and biological components of a stream ecosystem and ideally leads to a self-organizing, self-purifying, and more resilient system that will ultimately require minimal management and cost less to implement and maintain. In ecological restoration, the return of predisturbance ecosystem components and their functions are emphasized, including biodiversity, and nutrient cycling and retention, as well as overall intrinsic value. In addition, social, economic, and health benefits (e.g., pollution reduction, ecotourism, recreation, and flood control) frequently accompany enhanced ecological integrity. Many political, social, and economic requirements are considered when designing stream restoration projects, and often many stakeholder groups are involved in a single project. These requirements can greatly complicate successful ecological restoration and must be considered to develop a successful plan. However, this article focuses only on the ecological aspects of stream restoration.